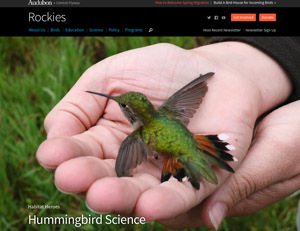 The heart of my interests lie in the ecology, conservation, and management of wildlife. Today we have available a wide range of molecular tools and techniques using cutting edge technology, such as next generation sequencing, that can help us answer a wide range of questions that were previously very difficult or impossible. 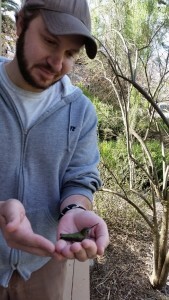 I use these, coupled with more traditional ecological techniques, to research species of interest and contribute to our knowledge of ecology in an increasingly changing environment. 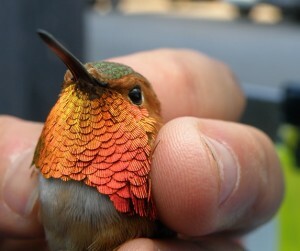 Hummingbirds are beautiful, charismatic birds that are popular with the general public. However, very little is known about much of their basic ecology, population structure, and potential stresses from the changing environment and landscape, especially in North America. 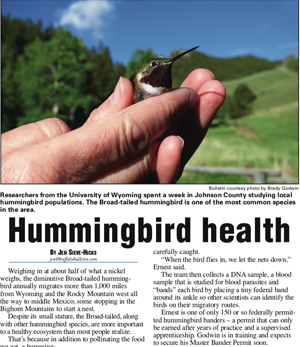 I use genomic techniques to investigate the population structures and genetic diversity of hummingbird species in the Western United States and couple those findings with landscape ecology, avian disease and parasite prevalence, and climate change in order to better understand the current status of these species. Sentinel species are a specific type of indicator species, used to give indications of environmental threats and hazards that could pose risks to humans. They are, essentially, “canaries in the coal mine.” Specific and targeted monitoring for many of these hazards, such as air and water pollution, can be highly effective. 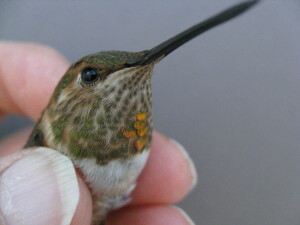 However, if the specific hazard is unknown or the environment is exposed in pulsed events that could be missed by humans, sentinel species are ideal to monitor as they will accumulate any and all hazards in the environment and we can study their populations, distributions, and physiology to find warning signs. This sort of work is often cheaper than extensive chemical testing in laboratories, and can give strong initial support for beginning that sort of targeted monitoring. 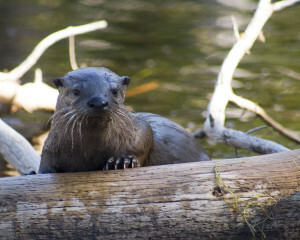 North American river otters are a sentinel species for water pollution and have been used to indicate poor water quality in instances such as runoff from mines and the Exxon Valdez Oil Spill. I used non-invasive genetic methods to estimate river otter population densities and distribution in the Green River Basin in Southwestern Wyoming. There is growing concern over increased energy extraction in the region and its effects on air and water quality. I found that otters strongly avoid stretches of river closest to, and immediately downstream of, the most intensive energy extraction. This distribution could not be explained by natural factors such as riparian habitat and prey. I found that the increased human activity may be deterring otters from certain areas, and in those areas there was also unusually high water conductivity, potentially indicating contaminants in the river. It is my hope that this study will provide support for intensive surface water monitoring in the region. 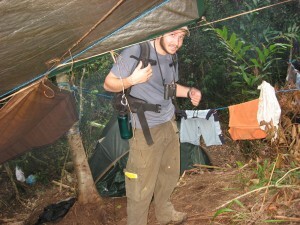 During my undergraduate education I obtained an internship in Madagascar working for Dr. Erik Patel surveying lemurs in a remote part of the northeastern rain forests. The number and diversity of endemic species of all taxa on the island is incredible, and they are almost all threatened by a very high rate of habitat loss across the entire island. This experience cemented my interest in ecology and conservation, especially in threatened biodiversity hotspots, and has shaped my career and research since. 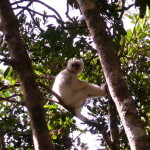 I encourage anyone that is able to (responsibly) visit, work in, or donate to help the people and wildlife of Madagascar, to take the opportunity to appreciate and support that unique island. I was born and raised in Wilmington, Delaware, where I spent as much time as I could exploring the woods, streams, lakes, bays, and beaches. I attended Marlboro College in Vermont for my Bachelor of Science degree majoring in Conservation Biology. 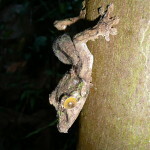 My thesis included an overview of conservation strategies in tropical developing countries, an analysis of lemur population densities, and an experiment on nocturnal gecko physiology. I came to Wyoming and completed my Master of Science at the University of Wyoming in the Department of Zoology and Physiology. I studied river otter populations using non-invasive genetic methods, and investigated river otter distributions in relation to energy development in western Wyoming. 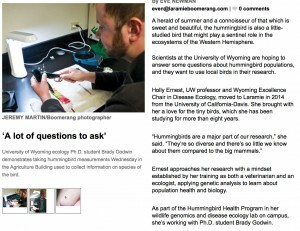 I began my PhD studies on hummingbird genomics and disease ecology at the University of Wyoming in January, 2015. When not working I’m usually drawing, sculpting, cycling, or hiking with my dogs in the beautiful mountains near Laramie. B.L. Godwin, S.E. Albeke, H.L. Bergman, A. Walters, and M. Ben-David. (2015) Density of river otters (Lontra canadensis) in relation to energy development in the Green River Basin, Wyoming. Science of the Total Environment, 532: 780-790.